I’m sure many of us have used this passage many times as a word of encouragement to those of us who feel they don’t have enough faith to tackle a big “mountain” situation in their lives. Hearing the very words of Jesus encouraging all that anyone can some degree of ‘faith’ but it takes a faith that trusts in God at all times, especially when things are looking shaky! Jesus’s statement to His closest disciples rings true, especially when we already know that He’s equipped us to take on the most difficult circumstance. In this passage, I found it kind of interesting actually that Jesus’s gentle rebuke was of what happened way back in Matthew 10. A lesson about faith and trusting God but certainly an example of God’s patience with us. Here, Jesus, with Peter, James and John, had just come down from the “Mount of Transfiguration.” This has to be one of the most dramatic spiritual moments for them, everything seemed most excellent! But, no longer than the time coming down, they encounter a man with a demon-possessed child. The man begins to tell Jesus that he brought his son to Jesus’ disciples, but they couldn’t cast the demon out. This takes us back to Matthew 10 when Jesus was commissioning them to go out and do the work of the ministry and among other gifting’s were given the authority to….cast out evil spirits. Jesus then chastises them for their lack of faith and then casts the demon out of the boy. And when the disciples ask why the demon didn’t obey their command, Jesus answers with the text we began with here in Matthew 17:20. Jesus wasn’t saying the mountain literally would move, but was referring to the demon inside the man’s son that was causing all the turmoil would be taken out by the authority of the Spirit of God. Jesus was telling His disciples that, if their faith was STRONGER, they could have commanded the demon to leave the boy, and it would have been so. REWIND back to Matthew 10. Jesus was NOT saying that mustard seed-sized faith can literally move mountains. Jesus was using an common expression of those days that to a Jew of Jesus’ day, a mountain was a metaphor signifying what seemingly before someone looked like a impossible task. 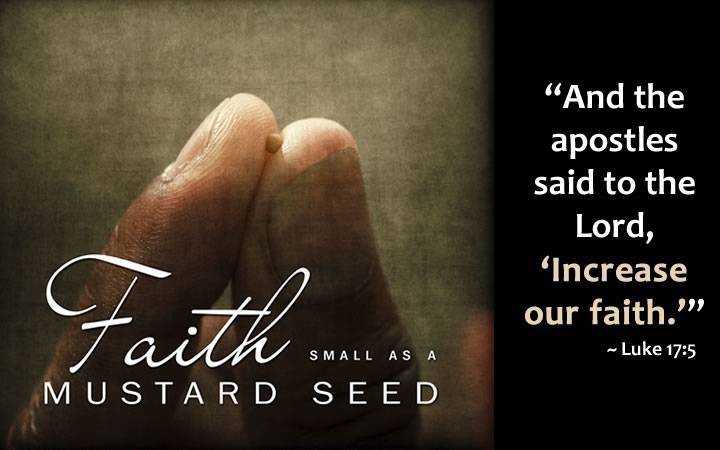 What Jesus WAS saying was that even a little bit of faith—the faith the size of a tiny mustard seed can help one overcome mountainous obstacles that come across our paths. And yet, here in Mathew 17:20 we see these same disciples struggling with their faith. There are many reasons for why we as Christians, like the disciples find ourselves at times struggling with our own faith. It’s interesting that in our daily lives, we don’t trust complete strangers. The more intimately we know someone and the more time we have had to see him “in action,” the more likely we are to believe what he says and establish a level of trust. But, if God is essentially a stranger to us, we are less likely to believe what He has said in His Word and when we are tested, we waver in our trust in Him. Spend more time in God’s Word getting to know Him through the daily reading, meditating, and memorizing of Scripture. So that when times of mountainous obstacles appear we might remember all God did and trust Him at His Word as He uses the obstacles to strengthen our faith to trust Him until it becomes consistent. Faith is an action, it begins with do you believe God can do this for you? So maybe today you’ve discovered that your faith is in need of increasing but don’t know how or where to begin. Prayer– Like the Apostles, ask Jesus to increase your faith. Next God Never Gives Up On You!